Everyone knows the point of using bootstrap generators, though maybe not everyone uses this help in their workflows. Some prefer to design/develop everything from a scratch, and others opt in favor of saving time for other important things, deriving benefits from tools provided by a community. When it comes to race against the time, generators are irreplaceable — especially those with intuitive and straightforward interfaces. You can find builders for various needs from creating your typeface to a working website; however, in today’s post we are going to review 13 builders that provide you with tools for creating polished, beautiful and modern buttons suitable for Bootstrap-powered web projects. With integral configuration options such as color, size and custom icon, the generator enables you to turn simple links into eye-catching call-to-action buttons that will certainly appeal to your audience. 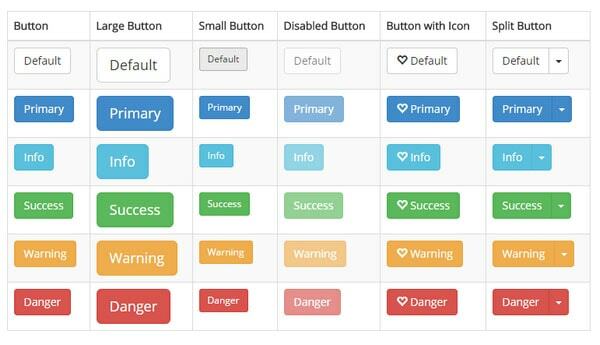 Buttons entirely comply with designs powered by Bootstrap 3 and are based on a flat style. Unlike the previous example where you are slightly limited in choices, this simple button builder lets you choose whatever color you like or need. You can assign a tone for text, background, border and even for active background. It is very handy for those who use a nonstandard color scheme. Bootstrap Button Generator ships with a pack of customization options including size, style, several default colors, state, two choices for width (auto or full width), and parameters for adding tiny intuitive glyphs. With a charming live preview window on the right that immediately displays changes; you will be able to control the whole process more effectively. Moreover, the service allows for editing existing buttons. Although Bootsbutton leaves users with a little choice that implies default pre-defined options such as eight button colors, four button sizes, four button types, three button states and a whole slew of glyphs presented in white and black in order to improve an informative side of a button, you still will be able to create a required call to action for your design. The author offers two generators in order to meet requirements of projects based on Bootstrap 3 and earlier versions. Although, much like in the previous example, you are strictly limited in configuration options, since the builder includes only two button variations (flat styled and gradient styled), yet the great thing is that you can set your color through entering hexadecimal code. Beautiful Buttons for Bootstrappers lets you create smooth buttons with a nice 3D appeal through gradients. By using handy sliders, you can control amount and percentage of hue, saturation, lightness and puffiness. You can also assign a particular color. The resulting code snippet can be also used in non-bootstrap projects. The developer offers several button generators that are aimed to simplify the creation of buttons for any project. Listed below service enables you to create a proper code that will comply with bootstrap framework. As usual, you can choose color, size, type and state for a button, and color, position and glyph for a support icon. Bootstrap Magic features a standard range of buttons that meets requirements of Bootstrap foundation and perfectly blends with the flat style environment. It is a professionally created theme for bootstrap that includes all essential elements for creating websites. The built-in editor lets you adjust weight, color, background, border and icon for six types of buttons (default, info, primary, success, warning and danger). Similar to the majority of the above generators, this small button builder includes the same scope of configuration options that enables to customize buttons by color, size and icon. The latter is aimed to indicate various functions starting from the menu and ending with mute. Although here we feature button generator for Twitter Bootstrap 2, indeed the website has a generator for a fresher versions of the foundation, inlcuding Bootstrap 3. Depending on the version of the grid system that underlies your project, you can create appropriate buttons on the fly. Twitter Bootstrap Button Generator is suitable for those who have projects driven by older versions of the grid system. Set of parameters covers four types, four standard sizes, seven default colors,three states, icon position, icon color and a great bunch of solid glyphs. Button X is a pretty flexible tool for generating buttons that give a full control of this integral component. You can assign color, style, size and typeface for a button caption, border and color for a button and even add a shadow to boxes or text. The generator is also appropriate for creating graphics for non-bootstrap websites. We have already featured this helpful website that includes several button generators suitable for various needs. This one is well-suited for websites driven by Bootstrap 3 foundation. As befits, a range of parameters are available to define button color, size, type and state, as well as assign an appropriate icon. Though creating a button from a scratch is not a difficult task, it requires a certain level of skill and plenty of work. When it comes to huge and complex projects where everything should be planned to the last detail, tools for streamlining workflow and saving time are a great option. In such cases, a generator that allows building custom buttons within seconds that is suited for Bootstrap-driven projects is a godsend.